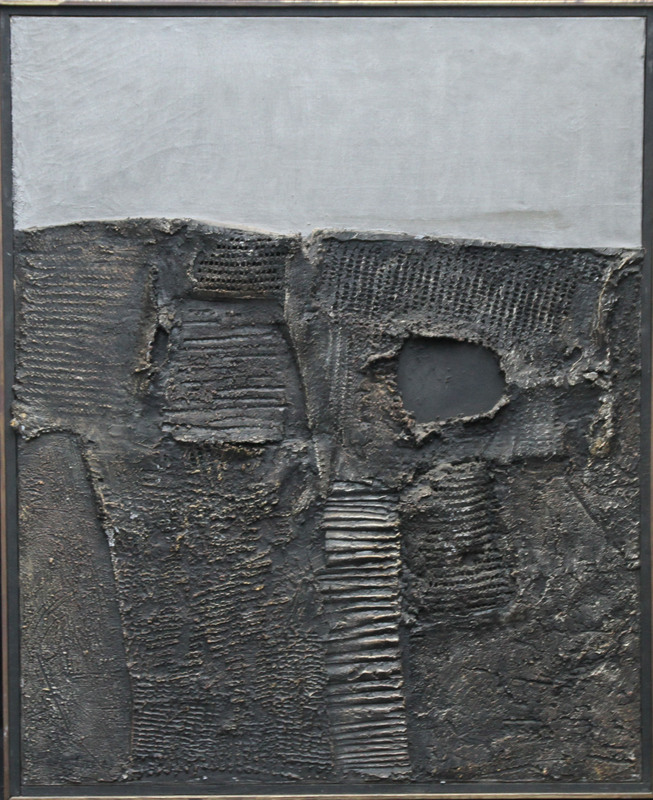 This amazing large 1963 abstract landscape mixed media composition is by Greek artist Valerios Caloutsis. His work is similar to Lucio Fontana, Spatialist. This movement focused on the spatial qualities of sculpture and paintings with the goal of breaking through the two-dimensionality of the traditional picture plane. Spatialism demonstrated a relentless interest in the relationship between surface and dimensionality. This is demonstrated by Caloutsis' painting, making holes in the picture plane and slicing through canvas in order to expose the dimensional space beneath. A stunning large composition from his time in Paris and an exceptional example of his work. Signed and dated 1963 and inscribed verso. Housed in a surround frame, 42 inches by 34 inches and in good condition. Greek artist Valerios Caloutsis was born on the island of Crete in 1927. After studying at the school of art in Athens, he came to England in 1952 and was for a while a student at St. Martin's School of Art. In 1953 he moved to Paris where he attended the Ecole des Beaux-Arts. He settled in the French capital and lives there today. He achieved success, particularly in the 1950s and 1960s, with fiercely abstract works in a variety of media. In Paris in the late 1950s he had solo shows at Galerie 93, Salon de Mai and Salon de la Jeune Peintures. 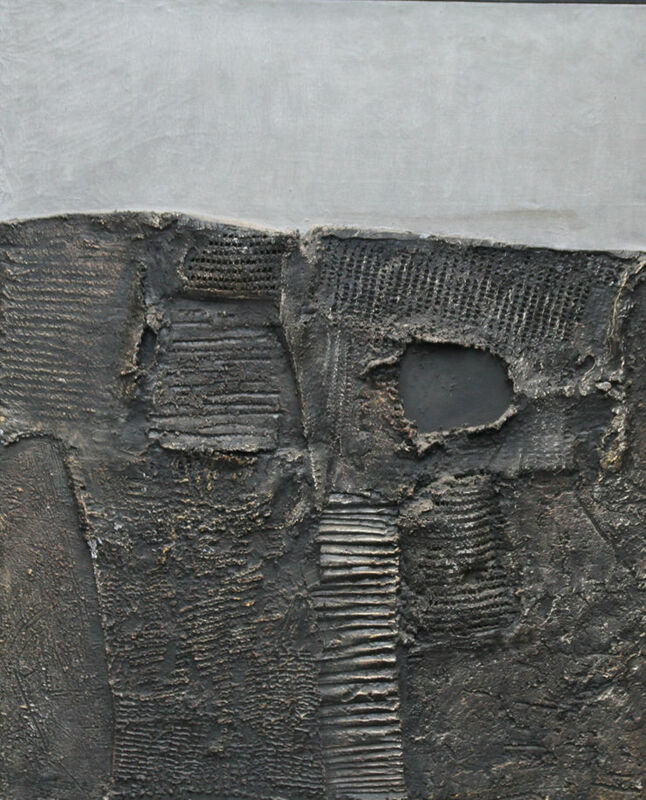 Caloutsis exhibited at the New Vision Gallery London in 1960, a work from which was shown at Bede Gallery, Jarrow's 1984 retrospective assessing the New Vision Gallery's influence, and had four solo shows at the Redfern in the 1960s. His work was also included in the major exhibition 'The Years of Defiance: The Art of the '70s in Greece' at the National Museum of Modern Art, Athens from December 2005-May 2006. Caloutsis is represented in the permanent collection.